Travel by mountain bike or trekking bike has been our passion for 29 years now. Whether crossing the Alps, enjoying Bike Events with lots of like-minded folks or riding dream tours from a fixed location, we do it all. Every ALPS tour offers carefully selected routes, harmonious daily stages and especially attractive hotels. Beautifil view from the planes de corones. At our the mountain bike tour „Marmolata“ (level 3) you can enjoy a 360 degree view over the alps. One of our best tours. From St. Anton to Lake Como. We start at the end of june then every week til the middle of september. Special Events: Perfect for partners, different levels, nice hotel and perfect destinations! Few extra costs and more then 29 years of experiences – these are just two examples of many advantages on all our tours. Our tip for everyone who's trying an Alpine crossing for the first time is simple: Don't make your decision solely dependent on whether the date fits your vacation plans. Assess yourself accurately and think of your vacation. Six or seven consecutive days in the saddle at an altitude gain of 1000 meters per day is nothing to sneeze at. Even for experienced mountain bikers, we therefore recommend starting your Transalp adventure with one of our easier tours. The experience will remain overwhelming nonetheless. We promise! More and more bikers manage the uphill flow with electric assist. On our regular mountainbike-transalp tours pedelecs are not allowed. We do not want to mix the groups. 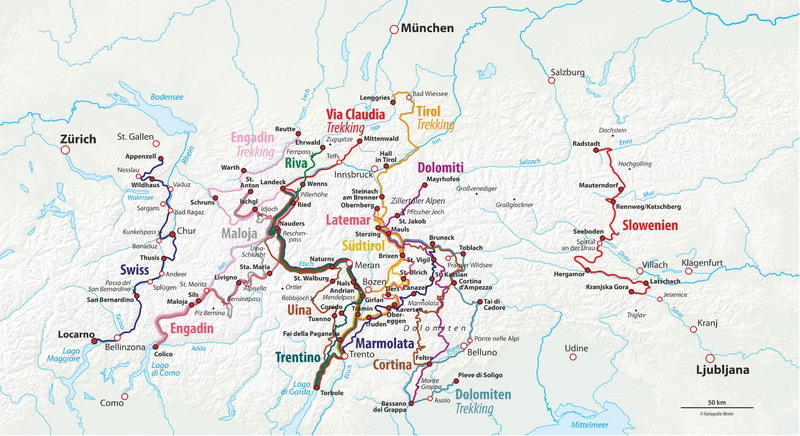 Only on our trekkingbike-transalp tours we make an exception, if previously announced. Nevertheless there are also exclusive dates for E-Bikes on our trekking bike tours as well.